Hideki Matsui of the New York Yankees was just named MVP of the 2009 World Series after winning the championship, in the new Yankee Stadium. But the baseball star, also known as “Godzilla” is also big in Japan as some sort MVP of advertising celebrity icon as this advertisement billboard, one of a whole series of ads for Kirin’s FIRE brand of coffee, shows. This ad says in the main copy “ボデイが強い。(bodei ga tsuyoi)” which translates as “A strong body” in referring to the “body” of the coffee while also referring to Matsui as well as the silouette of the king of all monster movies himself, Godzilla. The copy on the right reads　”10年目のNew Fire” which translates as “A New Fire of the decade” followed by “直火仕上げ (jikabi shiage) directly translated says “Finished by flame” but probably means “Fire Roasted”. 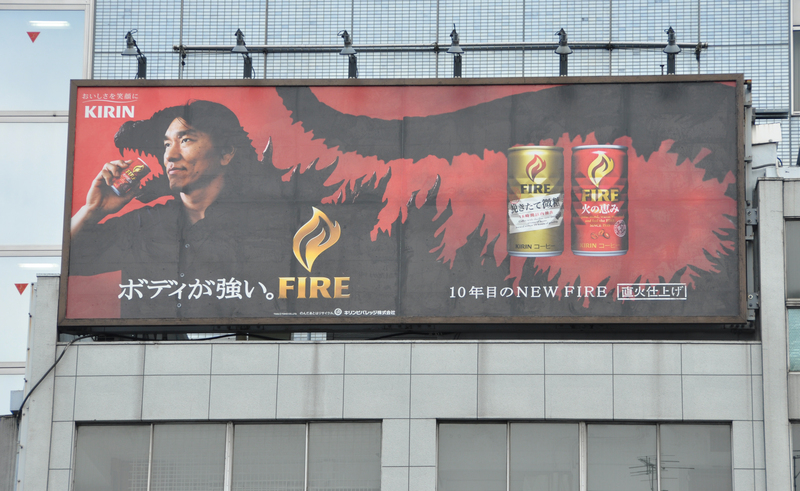 This series of Matsui Kirin “Fire” coffee advertisements can be found on billboards, the side of buildings, posters inside train cars, magazines and other published media as well as tv commercials and has been used since the tail end of August, throughout Japan. 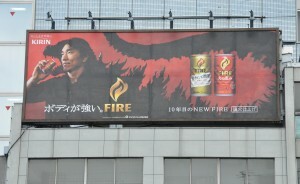 The concept is that this new FIRE coffee has a strong and bold flavor for strong and bold men (the TV commercial address the men of Japan with the classic Godzilla theme song playing in the background) On an interesting sidenote, Matsui’s jersey number, which he has had from his professional league days in Japan to his current stint in New York, has always been 55, which in Japanese can be read as GoJu Go or Go Go (five five). Coincidentally the rock band Blue Oyster Cult had a hit song in the mid-70’s based and titled after the monster “Godzilla” where the chorus of the song was “Go, Go Godzilla”. But whether Matsui is selling or swinging, you can bet he is hoping for a “monster” hit. Japanese advertising frequently use non-Japanese celebrities and popular media figures, as a quick search on YouTube or google for that matter will reveal. Others who have appeared in Japanese commercials and advertisements are Brad Pitt, Cameron Diaz, Tommy Lee Jones (also selling coffee), Jennifer Lopez, Catherine Zeta Jones, Robert DeNiro, Arnold Schwarzenegger and Richard Gere, to name but a few. Japanese commercials, supposedly pay as high as a Hollywood film for big name stars.